So August is here and so is our August 2015 Calendar desktop wallpaper for download, from your friendly neighborhood desi Traveler. 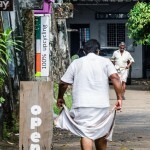 This picture was clicked in the birth place of Kathakali, or God’s Own Country Kerala during a performance I witnessed at Vivanta by Taj Kovalam in Trivandaraum or Thiruvananthapuram ( and you wonder how come desi Kids win all spelling Bee competitions in US ). I had seen Kathakali earlier but it was my first live performance of Kathakali in the birthplace of Kathakali. Needless to say I fondly remember the dance performance that was preceded by the story narrated, this is a small episode from Mahabharata the greatest epic of all times. Here the characters are playing Draupadi and Bheem, one of the Pandava princes. 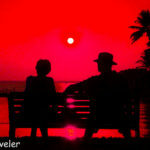 This particular picture was clicked when the two artists posed for photographers after the show. They were very kind and patient with us wannabe photographers who were shoving our cameras, cell phones etc. in their faces. I later had a chance to photograph Katkhakali artists do their makeup later in the trip, but that dear readers is another story, as each artist can take many hours to get the makeup right, and it is all done using a small hand-held piece of mirror while the artist colors the face with the other hand. Yes no makeup artists for the performers like our movie stars, and besides dance they also learn to do their makeup too. Anyway long story short without taking much of your time, here is the August 2015 Calendar desktop Wallpaper for download. 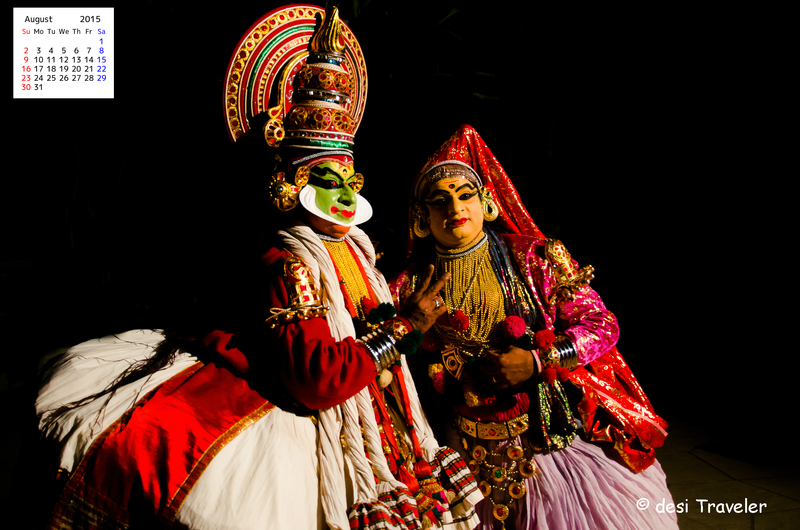 Ladies and Gentlemen, I give you Kathakali dancers from God’s Own Country for August 2015 Calendar Desktop Wallpaper for download. You can just click on the size you want and save the file as your desktop wallpaper calendar. At the long edge 1024 px, 1600 px and 2100 px. 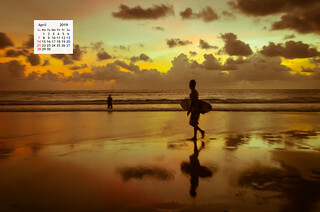 The August 2015 Calendar desktop wallpaper is all yours absolutely free to download and further share with your friends and family. 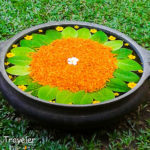 This is my little way of saying thanks to all the wonderful people who read and share posts on desi Traveler, your friendly neighborhood travel blog from India. The image was made handheld on a Nikon D7000 body with a Nikon 18-105 VR lens attached to it. Also soon coming are some more posts about my visit to Singapore so watch this space including a post that will have pictures like this one. Kathakali is a great art form. The picture is amazing. Great job…. You have no idea that ive been so obsessed with your blog that i myself started writing travel blog. Since your work is unfathomably awesome inwould request youto please visit my webiste too,which i started yesterday. And let me know as to how i can do improvements to it . I got to watch Kathakali make up once. So fascinating right? That’s an art by itself. You come up with some beautiful collections…Great job! It is an amazing picture! Excellent calendar. Thanks for sharing.